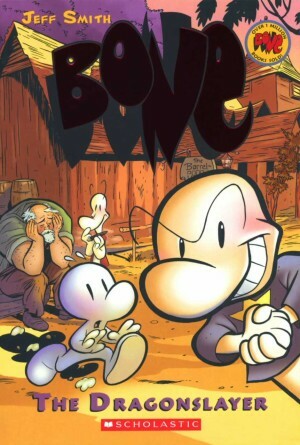 When Jeff Smith published the opening black and white comic issue of Bone in 1992 he was resolutely out of step with the times. 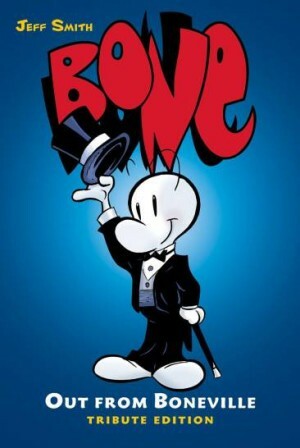 An animation artist drawing genial cartoon tales of peculiar round-headed creatures, ostensibly aimed at the younger end of the market, hardly rippled in the year Image Comics was launched. Smith worked hard to promote his material, and within a year it was attracting considerable attention, and picking up awards. The entire series is now available in a bewildering array of formats, and is constantly being reissued and introduced to new generations. 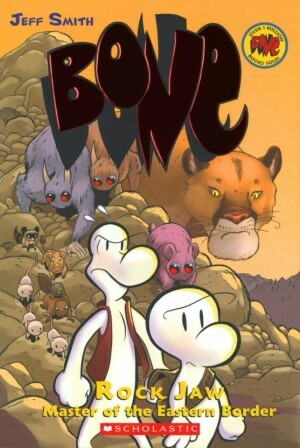 High on charm and captivating appeal, it’s safe to say Bone has been elevated to the level of the great all-ages titles. 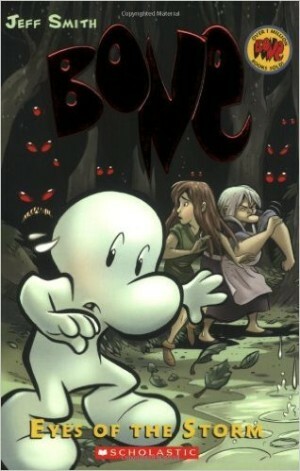 Out from Boneville opens with the three Bone cousins having been run out of Boneville. 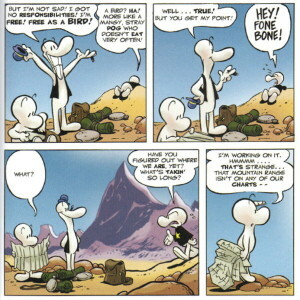 Fone and Phoney are relatively similar looking with large white heads and bulbous noses, and Smiley is taller and dimmer. 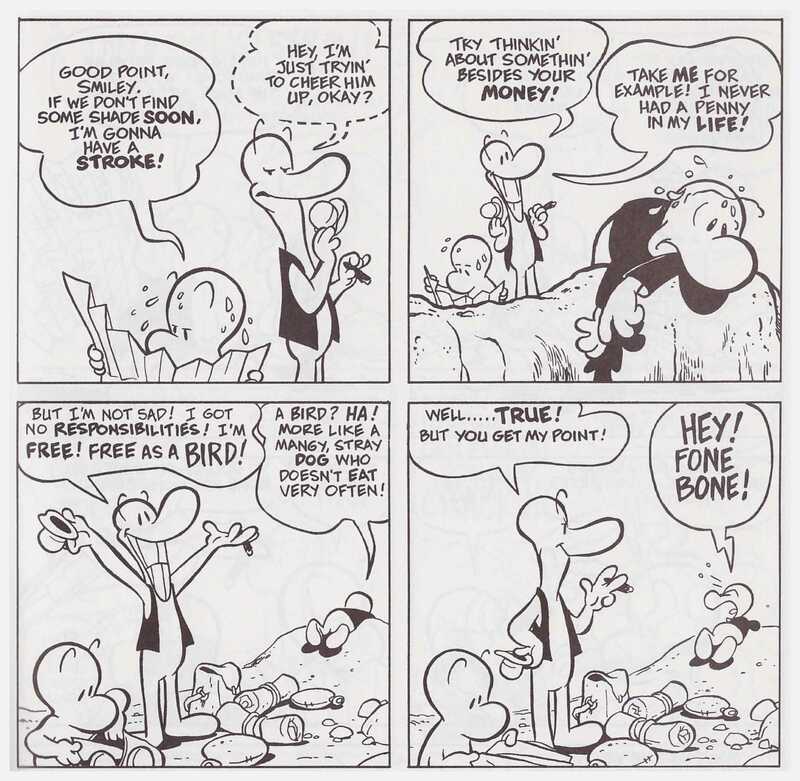 Phoney’s defining characteristic is his greed, and it’s a mayoral campaign gone wrong that’s the cause of their current plight, while Fone is the slightly timid voice of reason, and the primary focus throughout the series. Most other characters are more recognisably human, rustic folk living in small cabins and populating a familiar fairy tale environment with dragons, strange hairy rat creatures, and minute talking insects. Fone is separated from his cousins, and although he doesn’t realise it at first, he comes to the attention of a dragon who maintains a protective attitude toward him. Shortly thereafter he runs into the teenage Thorn, who lives in a farmhouse with her crusty Grandma, who resembles Popeye’s missing sister. Smith fuses Walt Kelly and Don Martin in creating a vivid world of delight, where there are threats, but they don’t become overwhelming. The malign rat creatures are continually confounded by their own stupidity, and while their hooded overlord comes across as more frightening, it’s not beyond the level of a Disney animated villain. By the end of the book most of the first rank cast is gathered in the Barrelhaven Tavern for the spring fair, which leads us nicely into the next book, The Great Cow Race. 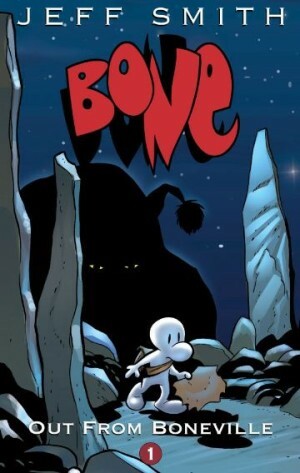 All Bone volumes are available in both black and white, and in colour. It’s debatable whether the colour is at all necessary. It was added by Scholastic Books as considered to have greater appeal for the general market, but artistically it makes little difference. 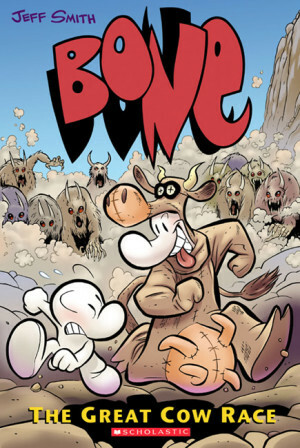 Smith took the opportunity to modify the story slightly for the colour publication, altering some dialogue, and occasionally removing or adding material. 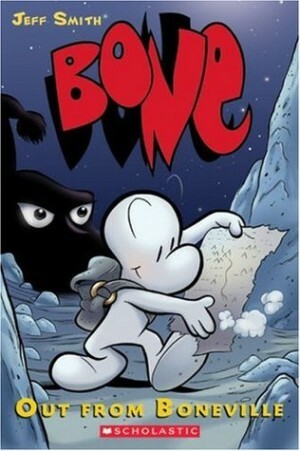 Those who’d prefer to the entire series between two covers also have the option of colour or black and white. 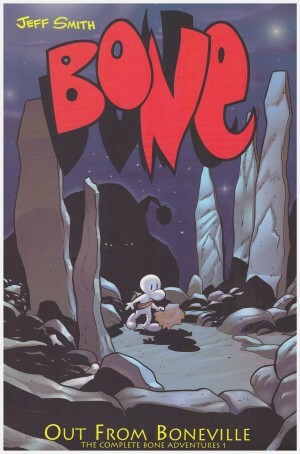 Then there’s the Bone Three Volume Collection, gathering this and the next two books, and most recently the Tribute Edition, now in hardback and with some extra material.